Summer shells and starfish make way for fall gourds, corn stalks, pumpkins, winter pine boughs, and pinecones. 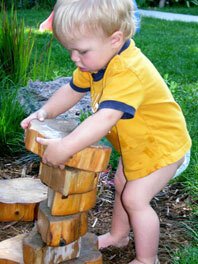 Children delight in daily opportunities to build, explore, climb and crawl. They investigate and imagine in the digging and sensory garden areas. They discover wonder with musical instruments and excitement with water play opportunities all in the wonderful outdoors. A weather observation area named "out of this world" was added this year which includes a rain gauge and thermometer. In this area, children strengthen counting skills through real-world applications as well as experience all of the seasons through hands-on activities. Homemade play dough is enhanced with mint, lavender and lemon balm leaves from the Scentsation sensory garden. These aromatic plants capture children's senses. There is a bounty of natural crystals to count with and twigs and seashells to create with. 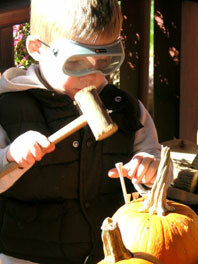 Theresa provides many opportunities for families to share in the wonders that their children experience outside. An annual picnic allows families a chance to enjoy the Nature Explore classroom with each other. Monthly updates inform of additions and changes to specific areas in the classroom and tell of opportunities their child will have to explore, create and imagine with particular items. Weekly photos provide parents with a visual of children playing in the classroom and parents are also exposed daily to their child engaged in play at pick up time. 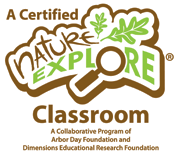 Through annual maintenance done in the Nature Explore Classroom areas; raking natural redwood mulch in the climbing area, weekly lawn mowing and watering, pruning of perennials and the addition of plants; the children enjoy discovering grasshoppers, hummingbirds, butterflies, caterpillars, birds, spiders and webs and much, much, more!